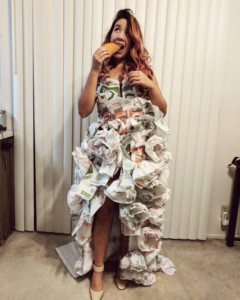 A burrito wrap wedding dress for a Taco Bell dream wedding! A couple weeks ago, Taco Bell announced it was giving away a dream wedding to their Taco Bell in Las Vegas. For those not in the know, this particular Taco Bell contains a true Vegas feature–a chapel. Wonder who would want to win a dream weeding at Taco Bell? Well, apparently, Diane Nguyen. So bad did she want the wedding, she went the extra mile and made a wedding dress out of taco and burrito wrappers. Lest you think it was “trashy,” understand that she did craft her creation from unused wrappers. No word yet as to if her efforts have won her the contest.